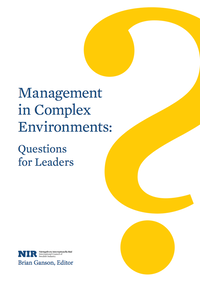 "This book poses the right questions for leaders to consider in defining the right approach to managing ever increasing complexity in our industry." "Major companies face significant risks and have serious responsibilities in complex environments. The answer lies in asking questions of the kind this book recommends for business leaders. Using them will contribute to making complex environments more peaceful and secure for companies and communities alike." Companies operating in complex environments require rigorous understanding of the economic, political, social and conflict dynamics of which they become part. Such insight helps them navigate substantial risks and challenges, grow their business even in unexpected places, work more effectively with local, national and international actors, and make meaningful contributions to stability and development. This book combines expert analysis, company case stories, and reflections from more than 100 business leaders. Drawing on a vast repository of knowledge and experience, it poses essential questions to better understand a particular complex environment and lead the company within it. It concretely demonstrates how leaders can help their companies meet their full range of goals – technical, financial, legal, reputation and social – by addressing the questions set out in this book. Funded by the Swedish International Development Cooperation Agency, the book is available�free for download and at cost from Amazon�and other major booksellers.